Founded The Voillot family has farmed this domain since 1870. Jean-Pierre began in 1980. I continue to hold Jean-Pierre in the highest regard—he is the quintessential Burgundy vigneron with an innate knowledge of winemaking that makes him one of the most respected, if not high profile, in the region. His wines are a masterclass in under-statement, letting the terroir do all the talking. 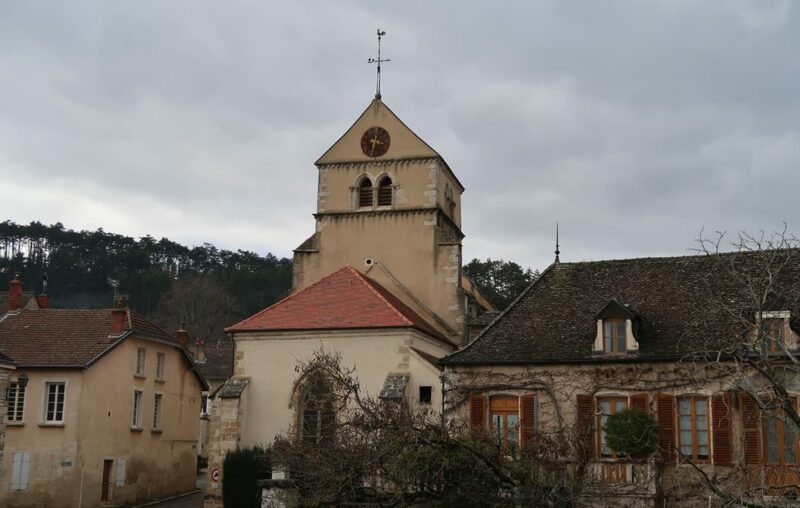 In July of 2014 Joseph Voillot died in the house he grew up in, just in front of Volnay’s thirteenth-century church (below). Joseph was a vigneron through and through, the fourth generation of his family to manage the estate, and he represented the old breed of Burgundian growers. On the day of his funeral, Volnay overflowed with those paying homage. Much like Joseph, son-in-law Jean-Pierre (below) came up steeped in Burgundian culture. His father managed grower relations and wine selections for the then family négociant firm of Bouchard Père et Fils, and it was a natural for Jean-Pierre to study enology. After his degree, he embarked on a stint as a courtier, or local broker, of wine in Beaune, and fell in love with one of the three daughters of Joseph Voillot. That marriage put him at the right hand of Joseph, and for fifteen years the two worked together until Joseph’s retirement in 1995. During those years, Jean-Pierre joined the staff at Beaune’s viticultural school and taught winemaking to all manner of students, both French and foreign. In the late 1990s, shortly after becoming managing director at the domain, he undertook a series of small steps that came to be systematic changes. In the vines, he moved to sustainable farming. In the cellar, he did away with fermenting with a percentage of stems because he liked the essence of fruit. He did trials on the length of barrel ageing, and came to bottle his premier crus after roughly sixteen months in wood followed by a month or more in steel (fourteen months in barrel for the Villages; twelve to fourteen for the Bourgogne—with both classes also receiving a month+ in steel to rest and clear before bottling). The two Meursaults moved to a roughly fourteen month barrel regimen (Joseph left the wines of both colors in barrel significantly longer). Jean-Pierre has also shied more and more away from new oak, moving from around 30% new barrels for the premier crus to today using 10-20%. He lowered the sulfur additions. He experimented with filtration systems, and for several vintages bottled the premier crus without filtration. Eventually, he settled on one very light filtration at the mis, if necessary, because for him this gave the wine just that extra little touch of lift and purity. No fining for the reds; a light fining of the whites. He’s an old soul, Jean-Pierre, one quite committed and modest. Elegant in argument and clear in vision, he has no truck with tra-la-la. He cares deeply about Burgundy’s traditions and the structure of the family domain, and the cultural and artistic diversity that such things inspire. This goes a long ways toward explaining why this deeply pragmatic man won’t go for strict organics in what is a wet, northern climate. The first rule of a domain is to have a harvest—everything else flows from that imperative. It also goes a long way towards explaining why with the 2017 vintage he lowered his prices 8-12%. He did this after the 2018 harvest came in; two abundant years in a row, and time, as far as he was concerned, to swim against the tide of extravagance that has been carrying Burgundy for several decades now. He may well be the only one along the Côte to have cut prices with that vintage, and bless his heart for it. He did it because he would like ordinary people to be able to drink his wine. He is, as Neal Martin has written, the proverbial winemakers’ winemaker, known above all for purity of fruit, finesse, and clear expressions of terroir. Today the domain farms parcels spread across Volnay and Pommard (plus a piece in Beaune’s 1er cru Coucherias, which is partially declassified into the Bourgogne). All of the Villages parcels are farmed the same, and all of the premier cru parcels are treated the same; ditto for how these wines are treated in the cellar. The differences in aromatics and flavor come from the sites. In 2001 and 2004, many of those parcels were badly hailed, and this was repeated, stunningly, in 2012, 2013, and 2014. Those last three years saw hail coming in June or July and flaying the same swath of land from Meursault to Beaune, a consecutive cataclysm never before recorded. Crop loss averaged as high as fifty percent. 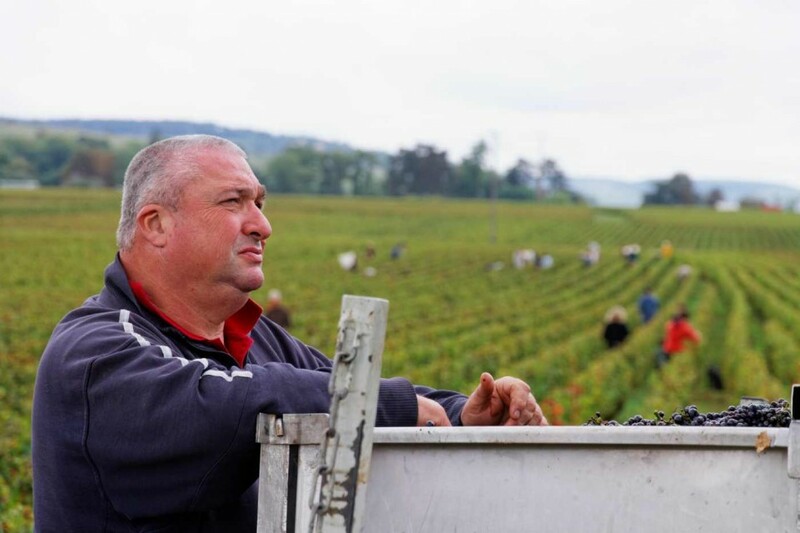 Following that third hailstorm, Jean-Pierre sold his holding in Volnay’s Les Brouillards vineyard, and now his total vineyard surface is nine hectares, or just over twenty-two acres. In the early morning hours of April 27, 2016 the worst frost in seventeen years descended upon Burgundy and the domain lost well over 50% of its crop. On a far brighter note, Jean-Pierre’s nephew, Etienne Chaix, joined the domain earlier this same year to eventually take succession, thus ensuring that the domain will remain within the family. 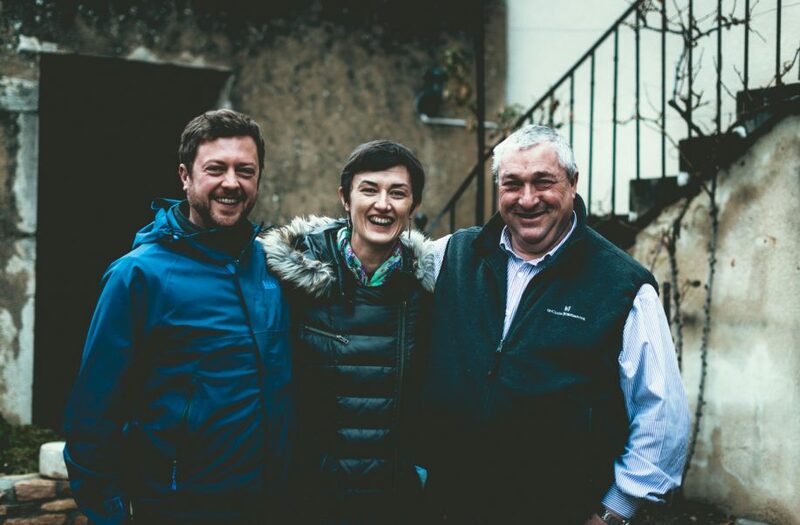 Photo of Jean-Pierre with Mike Daniels of Vintage ’59 Imports and Mélanie Pfister of Domaine Pfister courtesy of Jeff Bramwell. Pinot Noir Four parcels totaling 4.3 acres whose vines average over 50 years old. They are located immediately below the Volnay Villages AC vineyards, making this a Bourgogne of unusual pedigree—apart from a small percentage of Beaune premier cru that is thrown in, this wine is all from the commune of Volnay and it is 100% Pinot Noir (legally, a small percentage of Gamay is permitted in this class of wine, and négociant bottlings above all often take advantage of this option). In addition, this traditional wine is raised entirely in older barrels rather than in tank. 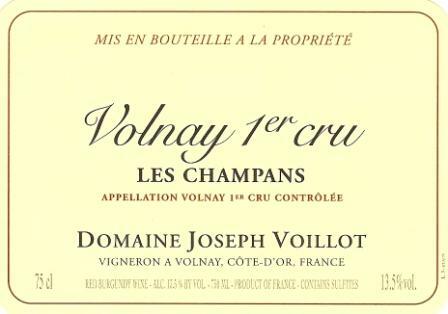 Volnay Vieilles Vignes Pinot Noir Eight parcels totaling nearly 4.5 acres whose vines average 50 years old. The main volume comes from the lieux-dits of Famines, Gigotte, Pasquier, Grands Poisots and Petits Poisots. Pinot Noir Four parcels—Cras, Poisots, Saussilles and Vaumuriens—totaling 3 acres with the vines averaging 54 years old. Volnay 1er Cru "Les Caillerets"
Pinot Noir 0.34 acre whose vines date from 1984. Name refers to the stony soil. Pinot Noir The domain’s largest premier cru holding, a parcel of 4.2 acres whose vines date from 1934, 1971, and 1985. 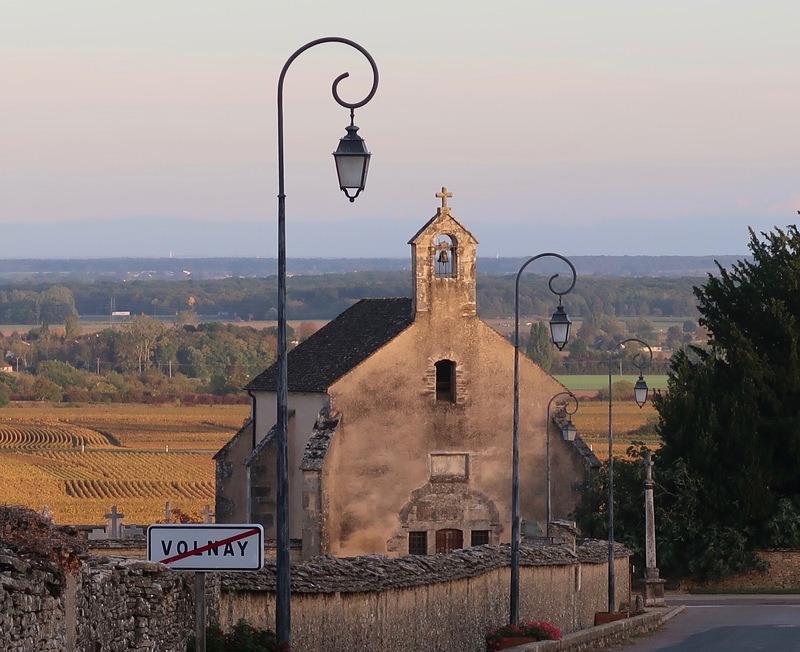 Within the premier cru band, Champans is down slope and has heavier soils, giving its wine more fruit and breadth than other Voillot Volnays. Pinot Noir 1.5 acres whose vines date from 1932, 1950, and 1978. One of those 1932 vines is pictured in the last photo above, and its right cane can just be seen arcing downward—it's one of a handful of very traditional "mother" vines among this group of old vines, directed downward into the ground to take root before continuing along the trellis. This parcel is up slope, and the wine is very calcaire, or limestony—you taste the stone in this elegant, intensely perfumed wine. 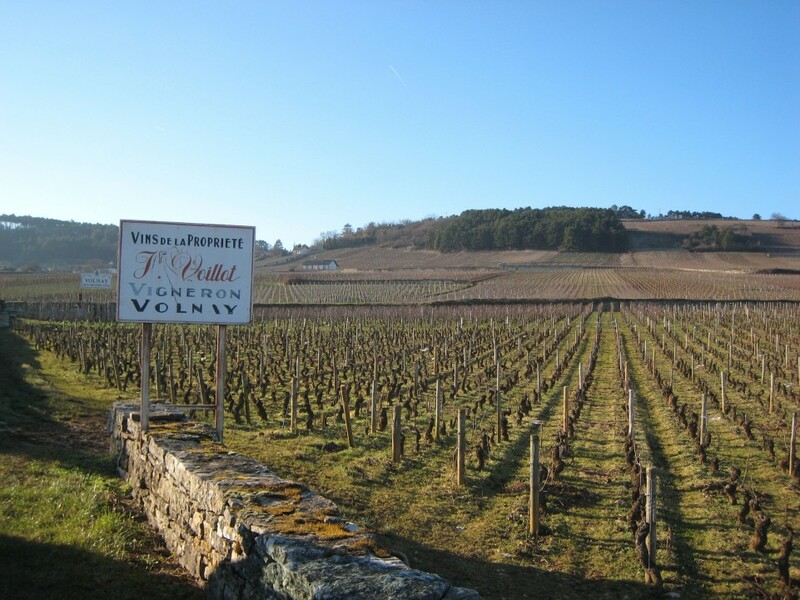 It's Voillot's most quintessential Volnay, yet paradoxically the vineyard borders the Pommard AC. Volnay 1er Cru Carelle sous la Chapelle Pinot Noir With the 2011 vintage, Jean-Pierre began purchasing a few barrels of wine with his négoc license from two well-known grower friends. Both farm vines next to his parcel of Champans and in both situations the vines average at least 50 years old. Carelle sous la Chapelle grows adjacent to Champans on a slight rise or knoll directly behind a small chapel. This rise is a rock outcropping that adds a floral note and tannic structure to Champans' fruity, earthy profile. Volnay 1er Cru Taillepieds Pinot Noir This is the second négoc wine, two to three barrels purchased right after the vinification and raised in the Voillot cellars. Taillepieds is up slope, just across the route nationale from Champans, and is a more elegant, structured and stony wine that pays off handsomely with bottle age. Pommard 1er Cru Les Epenots Pinot Noir 0.43 acre parcel planted in 1961. 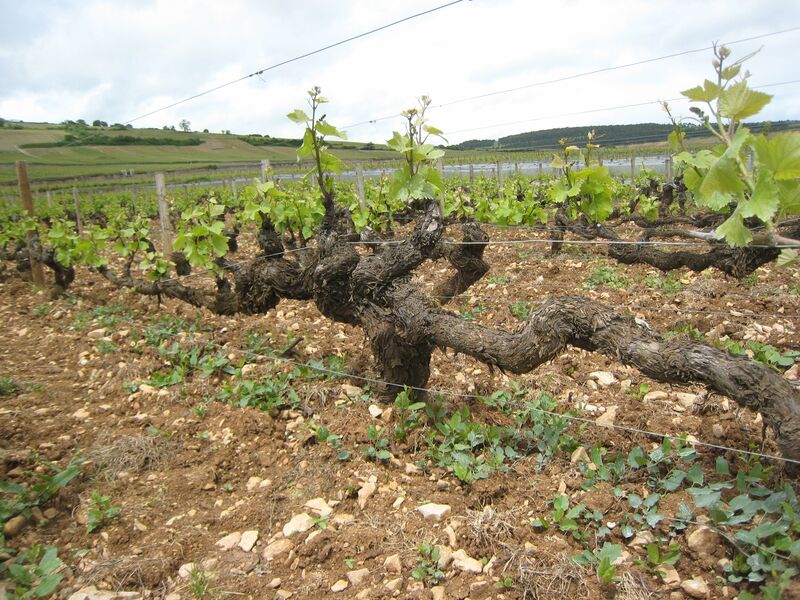 These vines are in Les Petits Epenots, on the north side of the village and on the clay-rich plateau below the shoulder where Pézerolles is located. Pommard 1er Cru Clos Micault Pinot Noir 0.34 acre parcel planted in 1958. This clos is on the south side of the village, across the road from Rugiens. If Rugiens is all about structure, Clos Micault is all about fruit. The parcel is the original Voillot family vineyard, purchased by them in 1870. Pommard 1er Cru Les Pézerolles Pinot Noir 1 acre whose vines date from 1963. This vineyard grows north of Pommard on the shoulder above the Epenots field, and the wine is notable for its spice, balance, and length. Pommard 1er Cru Les Rugiens Pinot Noir 0.62 acre whose vines date from 1959. This parcel is located entirely in Rugiens en bas, south of Pommard. Meursault Les Chevalières (lieu-dit) Chardonnay 0.37 acre whose vines date from 1979. These vines grow high on the western slope above Meursault, giving the wine a stony elegance. In a normal year, three barrels are made, one of which (25 cases) is sent to the USA. Meursault 1er Cru Les Cras Chardonnay 0.34 acre whose vines date from 1963 and 1980. This parcel grows immediately north of Meursault, below the road heading over the pass to Auxey-Duresses. The Santenots vineyards are close by and the soils are relatively heavy here, making for a wine of rich substance and longevity. In a normal year, three barrels are made, one of which is sent to the USA.